Thanks to Art Donahue, we now know the full story of this area! Here are his details and his pictures! My Dad was Arthur W. Donahue. He died in at age 53 in 1968 when I was 13 years old. 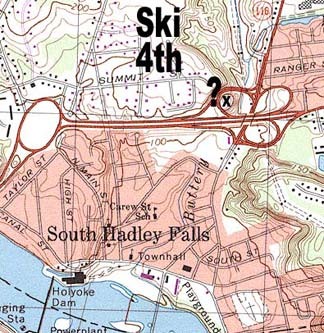 He had been involved with the Holyoke Ski Club after World War 2 ( I think he was the president for awhile) They bought a portable rope tow in 1946 (when he was 32) and set it up in South Hadley at a place they called Ski 4th! This portable rope tow was supposedly transportable on a sled, so that it was moved from place to place on roads during snowstorms, before the roads were plowed. I believe this was the rope tow that was eventually sold to Wyckoff Country Club in Holyoke. I have sent along another picture from a hillside west of Holyoke that could be Wyckoff before the tow was installed or it could be Anniversary Hill Park, which was wiped out by Route 91 in the 60’s. Most of this info I’m remembering from conversations with my Dad 34 years ago, so I may have gotten it wrong, but I’d love to talk to anyone who remembers that time and place! 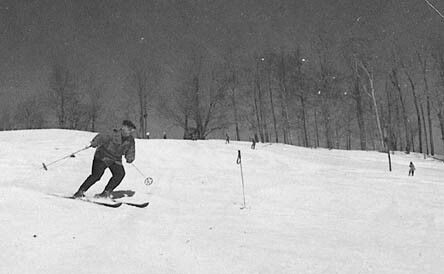 Here's my dad skiing possibly at Wyckoff, or possibly Anniversary Hill. Why travel North? Ski at Ski 4th! Save your car and your tires! Why drive all day only to find poor snow when we can practically guarantee the same thing closer to home? Seriously, we don’t claim to be able to give you the thrill of a long downhill run, but we are able to offer you the greatest variety of slopes to be found in the immediate vicinity. 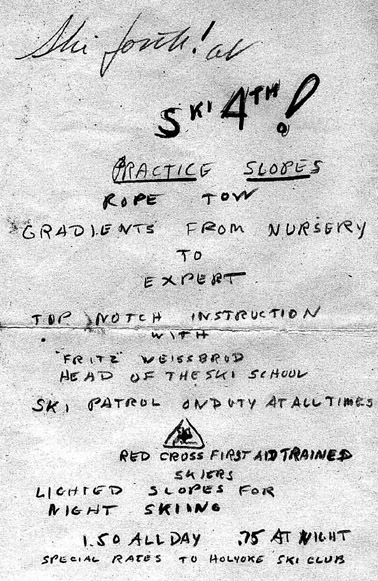 Practice slopes from nursery to “kanonin”, and an excellent ski school, headed by “Fritz” Weissbrod, all at reasonable rates. Our tow will accommodate 300 persons per hour, assuring you of a longer skiing day, by eliminating the back-breaking herringbone. We also offer night skiing, when conditions are right on lighted slopes, so there is no excuse for looking like a “snow-bunny” on week-ends. You can really look “sharp” by practicing at Ski 4th! Ski forth! at Ski 4th! 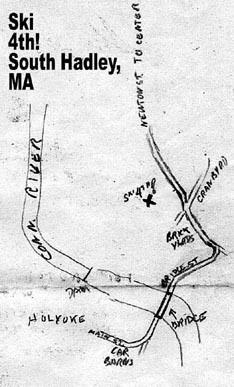 Directions to the area, 1940's. You are never too old to learn this most exhilarating sport! Get out in the open this winter. Buck up your health, nerves and spirit. Don’t wait for summer, acquire a winter tan. Come over to the Falls. Slopes for everyone, from the newest “sitzmarker” to the downhill expert. Our new tow eliminates hill climbing, just grab the rope and up you go! Members of the Holyoke Ski Club Ski Patrol will be on hand at all times to see that safe skiing habits are encouraged. Here's one of the old brochures, click on it for a larger version.